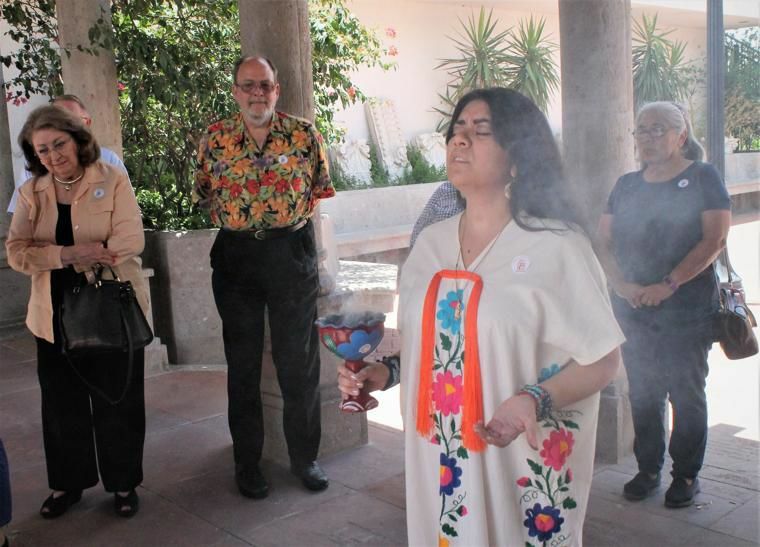 Pharr native and cuandera, Danielle Lopez, conducts the four-corner blessings on the patio of the Museum of South Texas History in Edinburg Sunday as part of the museum's Sunday Speaker Series. EDINBURG — In a white dress designed with Mexican floral and walking barefoot, Pharr native, Danielle Lopez, is a local Rio Grande Valley curandera who uses folk remedies for cures without using doctors or the medicines they prescribe. She was one of many intellectuals to speak at the Museum of South Texas History during the Sunday Speaker Series. The series, titled “Curanderismo: Past, Present, and Future,” was an open dialogue between speaker and guests to speak on the holistic healing practices. Before Lopez began her presentation, she gave her compliments to the museum staff in saying that she enjoys attending the speaker series as an audience member, but when they asked her to be a speaker, she felt honored to be on the other side. Additionally, she told the audience of approximately 30 that she wanted the audience involved and to tell their stories of what they know or have seen. In the beginning, she asked the audience to follow her to the patio, where she lit a cauldron and conducted the four-corner blessings, which is believed to bring good energy to cleanse bad spirits and to give thanks. “We went outside because traditional ceremony for the four-corners is used in different rites of passages and different cleansings and every tribe and different region, there is a different variation, but we all synonymously invoke the elements and invoke the mother and the creator into a blessing,” Lopez said. During the four-corner blessing, she turned to face in all directions; north, west, east, and south and chanted, which gives honors to all the ancestors. As a long-time curandera, she also spoke about the natural tea of moringa and using aloe vera with other ingredients that could be made at home or could be found at the local yerberia’s around the region. Pert assisted scientists, researchers and alternative medicine practitioners support their findings and their works. Throughout the two-hour session, audience members asked questions and told their stories about using orégano to cure the flu and snake’s venom as a vaccine. She added that there are still so many herbs that haven’t been discovered people need to protect the planet to save the natural herbs from plants that are being torn down. Lopez went on further to say that all cleanings need to be done in threes to remove all negative influences from within someone. She also advised people to stay around others with positive vibes and stay away from those who spread negativity. As a museum tie-in, a selection of objects from the museum’s personal collection pertaining to traditional healing, or curanderismo was exhibited and featured objects referencing Don Pedrito Jaramillo, who was a traditional healer who practiced in and around Falfurrias from to the late 1800s until his passing in 1907.